Letters are attacking! Destroy them before they hit or get past you using your X laser. The only way to stop the invasion is by spelling words! Japanese words pop up at the bottom in Romaji - spell the English translation by shooting the letters in the correct order using your Z laser! I.e. If "inu" is displayed, you spell "dog"
Completing a word replenishes 1 armour. Spell 3 words correctly and you win! 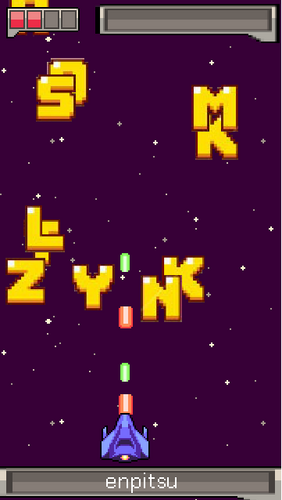 My first game using Game Maker Studio, so a lot of rough stuff and messy code. Did the fantastic tutorial over at http://learn.heartbeast.co/, and decided that I would try and use what I learnt there and adjust that game-type into a teaching experience for the game jam. This was built from the ground up again, but a chunk of the basic code is edited from that tutorial, though a lot of it is original (letter checking, laser types etc). Letter spawn frequency needs major adjustment.